Individuals with absolute pitch (AP) had a more active auditory cortex than non-AP individuals. Credit: McKetton et al., JNeurosci. “Perfect pitch” refers to the ability to instantly and effortlessly identify the pitch of a tone without the use of a reference tone. A person who possesses this rare gift can, for instance, hear any single note and tell if it’s an A or B-flat as easily as naming the color blue when seeing the sky. Mozart, Bach, and Beethoven are some famous composers who had perfect pitch. It’s estimated that about 1 in 10,000 people are born with the propensity for absolute pitch. Even among trained musicians, this is a rather rare talent. According to previous studies, perfect pitch runs in the family, suggesting a genetic link. However, this happens most often in people who had musical training before age 6, and after age 9 it becomes virtually impossible to develop truly perfect pitch. It follows that musical training is also a core requirement for developing perfect pitch. Which of the two has a larger relative contribution to absolute pitch has been a matter of debate, but a new study suggests that genetics may be more important. Writing in the journal JNeurosci, researchers led by Keith Schneider, Associate Professor at the University of Delaware’s Department of Psychological and Brain Sciences, compared the auditory cortex of 20 participants. These included absolute pitch (AP) musicians, non-absolute pitch musicians, and a control group of individuals with minimal musical training. 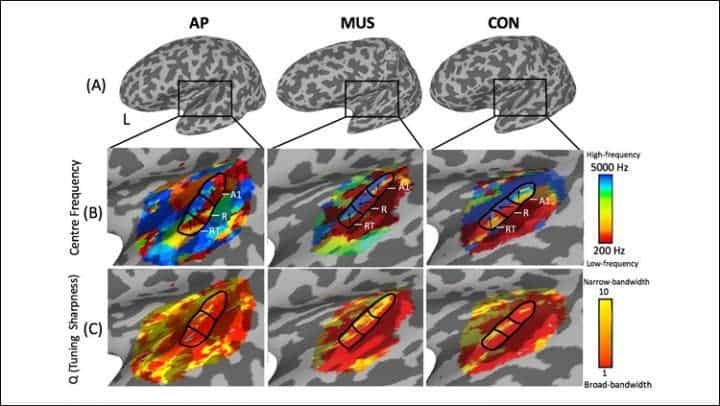 The brains scans suggest that AP musicians have a larger auditory cortex than the non-AP group, making it better equipped to represent distinct tones without a reference note. Other things that seem to influence the acquisition of perfect pitch include autism and tonal languages in which pitch conveys meaning, such as Mandarin or Vietnamese. In 2009, British researchers found that 20% of 72 teens with autism they studied had a superior ability to distinguish pitch. Interestingly, a 2018 study found that music therapy makes children with autism spectrum disorder more socially aware.